Tripod group with extra leg. This is the tripod group with an extra leg as shown by the marked - exchange. While the regular tripod group without the exchange is unconditionally alive, the tripod group with the extra leg is unsettled. If White plays first, the result is a ko. 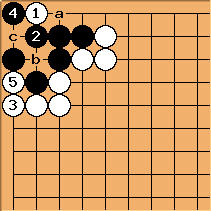 This happens because Black has actually one liberty less and is thus not able to live in oshitsubushi (see tripod group, diagram 7 and Comparison with regular tripod group below). and is the tesuji that turns the whole group into a ko. Note that has no other answer. starts a throw-in ko, and Black takes the ko first. This is the best for both players. 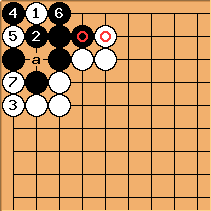 here is inferior, after , a ko is unavoidable. 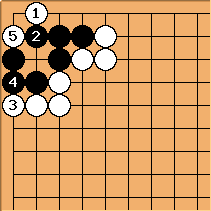 If Black a, then White b; if Black b, then White c. In any case, White takes the ko first. 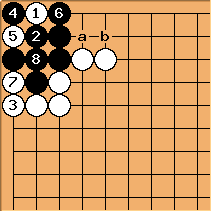 It should be noted that after and , it is not possible for Black to live by oshitsubushi at a because it is a self-atari move, so the result is still a ko. Here, it is just a transposition back to the previous diagrams. For the throw-in at , can also take the ko. 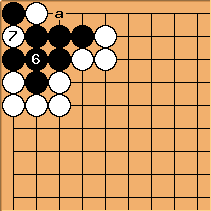 tries to live by oshitsubushi, but after Black is caught in a shortage of liberties instead and is unable to connect at a. 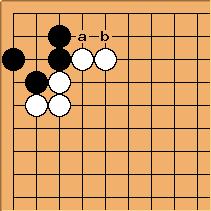 The result is Black b, and White a taking the ko. For reference, this diagram shows the regular tripod group without the extra Black leg at a and the White blocking stone at b. It is known that this regular tripod group is unconditionally alive, and we shall see that the Black a - White b exchange actually reduced Black's liberties. Recall this diagram from above. 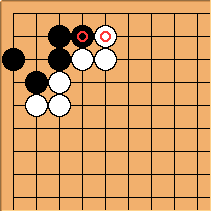 Due to shortage of liberties, Black cannot play at a to get oshitsubushi. Without the Black a - White b exchange, can actually play the oshitsubushi. Recall also this diagram from above. 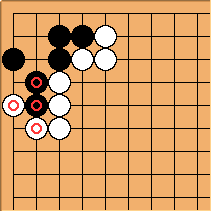 Due to shortage of liberties, Black cannot connect at a to get oshitsubushi. Again, without the Black a - White b exchange, can actually play here and live unconditionally. Variant of tripod group with extra leg. Note the position of the marked stones in this variant. 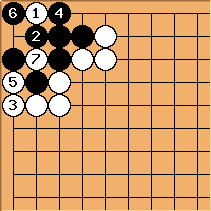 In this variant, the group is unconditionally alive, but White can gain some endgame profit by capturing the stones. The proof of life and the endgame benefit. 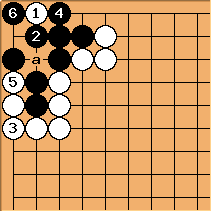 The attack starts with as usual, but after , although White can capture at a, Black can recapture to preserve two eyes. 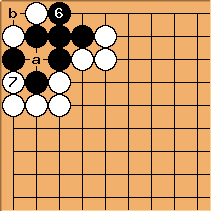 Of course, the endgame benefit for White is the capture two, recapture one. Beginner Exercise 83, Beginner Exercise 84, Beginner Exercise 85 and Beginner Exercise 86. Special properties of the corner.